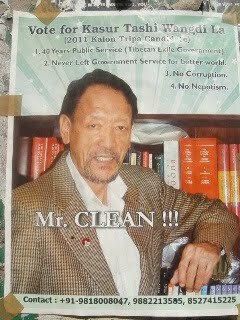 This note is in response to Kunsang Tenzin’s article, “Clearing the Air- The Mr. Clean Poster.” I am not a diehard fan of Tethong but since his campaign team seems to be in deep slumber, let me be the devil’s advocate here. Any person with the slightest IQ would understand why such poster and who is being targeted with this poster that acts like a double edge swords. On the one hand you are trying to describe the person but on the other hand you are doing a “side Kick” as we famously called. 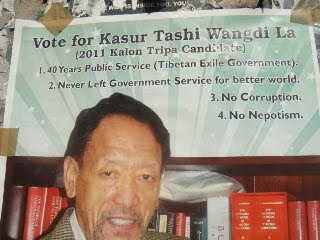 You are right that Kasur Tashi Wangdu has had an “impeccable, consistent and corruption free career “ and so does Trisur Tenzin Tethong. There is no difference between these two gentlemen on this issue. But, why was there such a need to highlight that obvious fact? Who is that Mr. dirty that you wanted to distant from? And why do TW campaign chose to use the same word that LS campaign team use to direct negative campaign against Tethong? Don’t you want to highlight his leadership qualities than those obvious one if you are seriously thinking about winning the race? Also, if that were just a statement of facts about the candidate, couldn’t there be no. 5 that says: "He never said, 'I want to be Obama of China'"? I am surprise that only “few of Kungo Tethong supporters raised concern” about this poster. They should be uproar against this poster. It was mean and dirty. The funny and more suspicious thing is that LS team is using this poster more than TW team. When I saw this poster, I thought that this was the work of LS team who are known for their notoriety in Delhi, Dhasa and Shichaks. The silent majorities are fed up of them and their negative campaigning. And with the speculation of unholy ties between LS and TW camp growing, people feel that Tethong suffered the most from negative campaigning. Tethong team should come out and in unison fight the negative campaign. Whether you do it or not, accusation against you will be there always. Support the Truth. I also would like to set the record straight that the poster contained one factual error. Kasur Tashi Wandgu DID leave govt. job for better world. According to his websites, he joined the service of exile Tibetan Administration in 1966. He left the service in 1968 and went to England for further studies until 1974 when he rejoined the service. Of the three Katri candidates, only Tethong hadn’t taken opportunities for further studies. Had he been selfish, he would have and could have. Rich in empathy and insight, Tethong heed the Tibet’s call for service and he served H.H. the Dalali Lama, Tibetan govt., and its people. Some people are strange as they question about Tethong leaving his service after almost 30 years of NON-STOP TGIE service while praises so much about person who has no record of government service. What messages are we trying to convey to the future generation? Would they be anybody who will value service, selflessness and dedication? 1. Dedicated his life for the Tibet’s cause with almost 30 years of NON-STOP TGIE service. 2. Not just being there but also provided a visionary leadership. 3. Never Stuck as a Kalon but became leader (Katri) of Kalons. 4. Never being selfish by taking opportunities for further studies in the West.